Post 1677 Casa Grande 4th Sunday of the Month 1300 hrs. Post 3584 Superior 3rd Tuesday of the Month 1800 hrs. Post 3713 Coolidge 1st Saturday of the Month 1100 hrs. 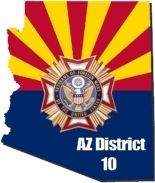 Post 7401 Chandler 1st Tuesday of the Month 1900 hrs. Post 7968 Apache Junction 2nd Monday of the Month 1900 hrs. Post 8053 Sun Lakes 4th Monday of the Month 1900 hrs. Post 9399 Superstition/AJ 2nd Tuesday of the Month 1900 hrs. Post 12166 Gilbert 3rd Thursday of the Month 1900 hrs. Post 9399 Superstition/AJ Meeting begins at 0900 hrs.